Swiss Safe Products has designed the most advanced emergency blanket on the market - meticulously designed to for outdoor enthusiast, the marathon runner or emergency first aid responders. It all starts with the material, metalized polyethylene, that reflects 90% of your body heat while offering waterproof, windproof protection from rain, snow, moisture, cold, and heat. Great for hiking, backpacking, climbing, camping, traveling outdoors or in the wilderness, and biking. Includes four individually packed blankets so you can easily throw them in your hiking backpack, car, first aid kit, go-bag, camping gear, or emergency kit at home or at work. Stay warm, prevent hypothermia or shock in emergency survival situations. 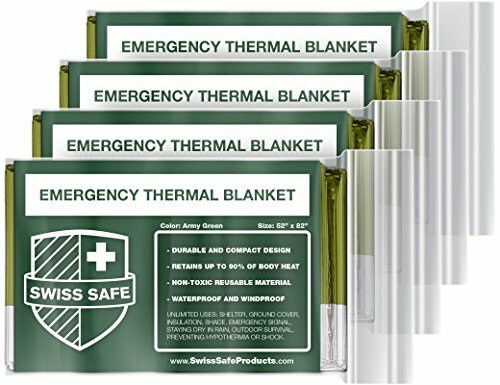 Swiss Safe is the only thermal blanket to offer a unique variety colors while also providing a superior product design with emergency survival in mind. Perfect for hiking, camping, boating, hunting, surviving in the cold outdoors, and to keep you dry in damp, wet, cold, rainy environments. In fact, uses are nearly limitless: use as tent footprint, backpack cover, rain poncho, emergency signal, solar oven, shade cover, fishing lure, bird repellent, emergency shelter, sleeping bag liner, ground cover, bivouac sack, wind blocker, arm sling, tourniquet, bivvy, trail marker, water collector, or even snow melt container. Customers from around the world rely on Swiss Safe Products to provide the highest quality safety products on the market. The Swiss Safe Guarantee promises to deliver an amazing product as described and if you're not happy for any reason, get your money back, Guaranteed! No questions asked. FOUR MYLAR EMERGENCY BLANKETS (Army Green) - Advanced dual-sided aluminized mylar blankets. If you have any questions about this product by Swiss Safe, contact us by completing and submitting the form below. If you are looking for a specif part number, please include it with your message.